Yoga For Golfers&REG; increases your body’s ability so you can play better, longer, with more confidence and increased enjoyment. You don’t need to be flexible or have any previous yoga experience. With modifications provided for all levels of individual conditioning, it’s easy to start at the level that works for you and advance as your body is ready. Improve your golf performance while at the same time, reducing the potential for injury with this foundational instruction series. 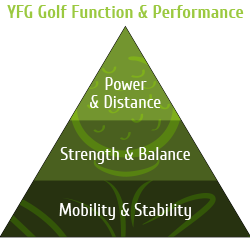 Following a stepped approach, each level of the YFG Golf Function & Performance Pyramid is addressed. This Par Level Series is the perfect start for those new to Yoga For Golfers® and is recommended for all fitness levels. A balanced body is the best foundation for an effective, functional golf swing - fluid, consistent and executed with ease. Strength and stability are necessary for more power and control in your swing and more endurance throughout your round. In this video, Katherine guides you through a series of exercises that cultivate the balance, strength and power you need to play your best golf.